AHEAD of the March 25th clash between Nigerian Super Eagles and Pharaohs of Egypt, Kaduna State Sup­porters Club yesterday called on Ni­gerians within and outside to drum-up support and cheer the Super Eagles to victory. Chairman of the Association, Ado- Garba Mohammed, who made appeal in Kaduna, said the match would be crucial and therefore needed massive support from Nigerians. Super Eagles are expected to face the Egyptian’s squad in a double header 2017 AFCON qualifier Match with a first-leg clash on March 25 in Kaduna. Mohammed said preparations for the Kaduna match is in top gear, add­ing that the team needs support from all Nigerians to ensure victory. “We have received assurances from fans and supporters from Kano, Bau­chi, Niger, Ekiti and Abuja as we are expecting them to storm Kaduna and the Ahmadu Bello Stadium (ABS) to cheer the Eagles to victory,” he stressed. He urged Nigerians to adorn them­selves and their surroundings in the beautiful green and white colours of Nigeria’s national flag as mark of pa­triotism when the Super Eagles file out against Egypt. “When we come out in our good co­lours, it will encourage our players to win in their home and also have good result in their away match. “This match is a very crucial one we have to win so that we can have hope in winning subsequent matches. 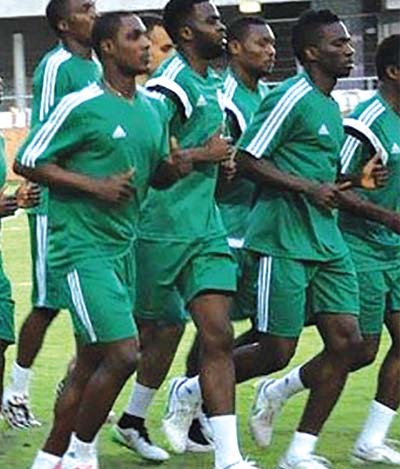 I want to see our Super Eagles playing in the 2017 AFCON competition,” he opined.